Like many species in the Magnoliaceae family, Magnolia longipedunculata is a highly attractive tree, with peach-white flowers and striking red fruit. Endemic to Guangdong province in southern China, just 11 wild individuals of this tree remain, scattered across evergreen broad-leaved forest in Nankunshan Nature Reserve. That is not to say that this tree has not put up a fight to survive – all of the remaining individuals have re-sprouted from stumps of trees that were logged many years ago for their high-quality timber. However, powers of regeneration can do little to guard against the other threats to this species. Magnolia longipedunculata’s restricted range makes the species extremely vulnerable to the effects of climate change – future, hotter climates at Nankunshan Nature Reserve may prove unsuitable for the only remaining wild population of this species to grow. Added to this, no wild-flowering Magnolia longipedunculata trees are currently able to reproduce naturally. This is thought to be due to a combination of factors, including the tree’s short flowering period and a shortage of insect pollinators. All these threats, together with its tiny population size, mean that Magnolia longipedunculata is Critically Endangered. 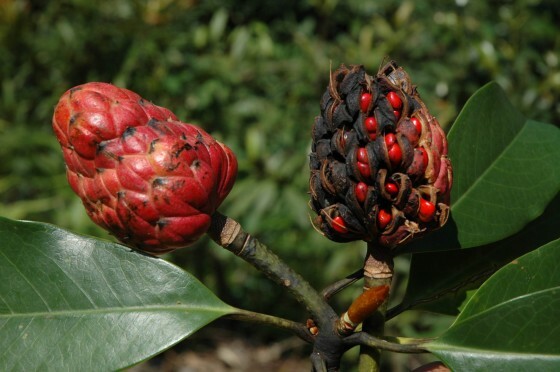 Since 2008, the Global Trees Campaign has been working with botanists at South China Botanic Garden to implement an integrated conservation action plan for Magnolia longipedunculata. To overcome the species’ reproductive barriers, the team have been carrying out artificial pollination and propagating seedlings, to establish ex situ living collections and to carry out reintroductions in the wild. 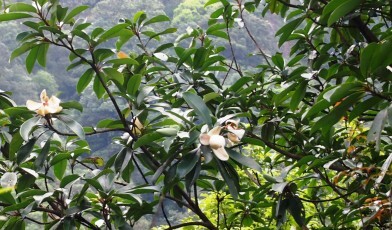 The team’s reintroduction projects have taken possible effects of climate change on the species into account – as well as bolstering the current wild population at Nankunshan, work is under way to establish new populations at sites which, in future climate conditions, may provide suitable sanctuaries for Magnolia longipendunculata. Seedlings have already been successfully established in Tianxin Nature Reserve, where it is thought that climate conditions may be more suitable in the future than the species’ current stronghold in Nankunshan. Research carried out in Tianxin and Nankunshan during the course of these planting projects also compared the effectiveness of two propagating techniques for successfully establishing Magnolia longipeduncula seedlings in the wild. The results from this project are now being applied to ensure that the best possible effort is made to secure a future for Magnolia longipedunculata.